Added on July 26, 2017 by Sam Sala. The Zodiac Knights Masters Group are holding a charity night in the form of an old time movie night. There will be lots of fun and entertainment. This event is raising money for the 2nd Glenroy Scout Group. they have cubs & scouts who are from the Glenroy Specialist School in Glenroy. They want to sen 6 to 8 cubs to the cuboree in September this year held at Gilwell Park. These kids are wheel chair bound and need two carers each to help them. This increases the costs of sending them to the camp. the kids have never been on a camp before and this may be their only chance to attend one. We want to make it possible. If you cant attend perhaps you would consider a donation. The charity night will be held at Greensborough Masonic Hall. There's plenty of parking available. Please contact Marie at The Catering Wizards on 0411152296 if you are interested. Click Learn More below to see more about this event. Added on May 13, 2017 by Sam Sala. Meeting will Tyle at 7:30pm as usual. Will open to the third after taking care of some Lodge business including the confirmation of the nomination of Bro. Simon Browning MM, as the next Master of Ivanhoe Grammarians Lodge. Closing from the third will be the short version. hope to retire to the South well before 8:20pm. There will be a very good selection of International and Australian (Tasmania) Whiskies which all attending Brethren are invited to sample. Presentation on the source of the Whiskies will be presented by Brethren of IGL supported by the expert staff from Dan Murphy’s Cellars. Dan Murphy staff will select and recommend the whiskies and assist our Brethren in presenting them. The usual hospitality in the South is offered to all visiting and attending Guests, W.Brethren and Brethren at no cost. wonderful caterer. For those Brethren who wish to partake of the Whisky Tasting, a very conservative charge of $20 per head will be charged. W.Bro Graeme Hawke will be more than happy to receive your $20 subscription to the Whisky Tasting before we Tyle. Those teetotaller or designated driver Brethren who do not wish to partake of the Whiskies are under no compulsion to contribute to the Whisky Tasting costs. But, hopefully will enjoy the descriptions and explanations of the origins and source of the whiskies being presented. 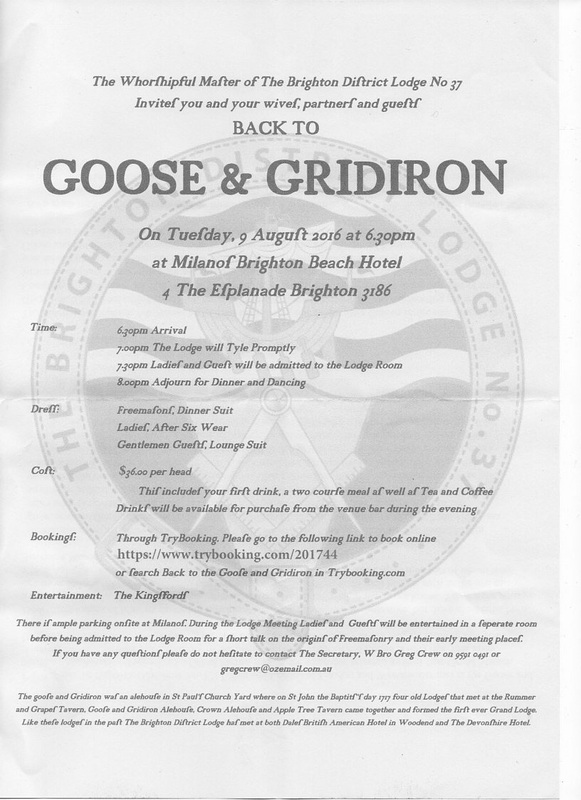 All Masters of the Enlighteners Group are also welcome to help celebrate the Worshipful Master's last Night as Master of Ivanhoe Grammarians Lodge and enjoy what will be great night of Brotherhood. Added on July 3, 2016 by Sam Sala. Added on March 16, 2016 by Sam Sala. The 2016 Combined Schools Lodge Meeting is being hosted by Melbourne High School Lodge 759 this year. Confirmations close one week prior for catering purposes.